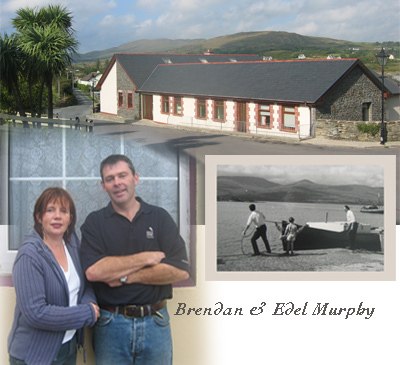 Edel & I own and run The BereIsland Lodge here in Lawrence's Cove ,Bere Island. In my father's and grandfather's time where the Lodge stands now was known as the Coal Yard. It was where the British Army kept its supply of coal for its barracks and quarters. It was obviously well positioned, being only a few yards from the quay and in the heart of the village. That's why, in 2002, we decided to use the site to build The Lodge, as purpose designed accommodation for today's visitors to the island. People say Bere Island is a magic place. Certainly, when we read our visitor's comments in the guest book we're reminded how special it is "Peaceful, kindness, laughter and sincerity..." writes one visitor, and "Thank you for connecting me to the real world. Next summer our stay will be much longer." writes another. And perhaps a favourite entry " I love the blackberries and butterflies." One mile from the mainland, in a world of its own across the Berehaven Sound from Hungry Hill, Bere Island runs 7 miles East to West at the mouth of Bantry Bay. It is serviced with frequent sailings by two licensed car ferries. One leaves from Castletownbere and the other, Murphy's Ferry Services, leaves from 'the Pontoon' (near the golf course) on its 30 minute trip to Bere Island Lodge, a three minute walk to the Lodge. 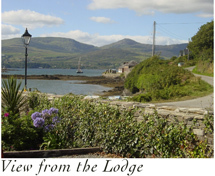 We do hope we'll have the chance to meet you here in person one day, meanwhile we'd like to give you a little webtour of our lodge and a glimpse of Bere Island.